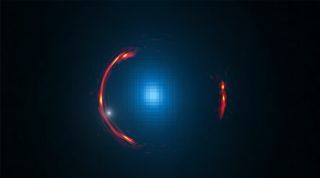 The gravity of a distant galaxy known as SDP.81 (the blue object in the center, imaged by the Hubble Space Telescope) distorts the light traveling past it into an Einstein ring (red arc) in this composite image. The small, white dot is the location of a dark dwarf galaxy hovering around the edge of the central object. Sometimes, a flaw in your magnifying glass can be a good thing; in the case of some new research, it can even reveal invisible dark matter galaxies. Astronomers probing the sky used the gravity of a massive galaxy as a natural magnifying glass, and they found a strange distortion on its edge. That distortion proved to be a smaller, invisible galaxy composed of dark matter. The discovery, explained in a new video, could pave the way to finding more of these unusual objects, providing a better understanding of the mysterious material that makes up most of the matter in the universe. "You know they are there because they distort the image of the background objects," Hezaveh said. Observing objects in the distant universe can challenge the limits of current technology. As a shortcut, astronomers can rely on a much older tool: massive galaxies large enough to distort space-time. As predicted by Albert Einstein's general theory of relativity, the enormous collections of stars serve as magnifying glasses by causing light to bend as it passes by. The distant light curves around the nearer galaxy, creating a so-called "Einstein ring." This reveals faraway objects behind the nearby galaxy. Scientists take advantage of the gravitational lensing phenomenon to study incredibly distant galaxies, many of which formed only a few billion years after the universe's Big Bang. The team of astronomers noticed that the newly updated ALMA's image of an Einstein ring known as SDP.81 contained a strange distortion, unveiled only after thousands of computers working together searched for subtle anomalies. The unprecedented detail of the star-free region around the closer lensing galaxy, known as the halo, revealed a distinctive clump of matter less than one-thousandth the mass of the Milky Way. This clump's location and mass, and the fact that no object could be spotted in the region suggested that the cluster could be an extremely faint dwarf galaxy of dark matter lying nearly 4 billion light-years from Earth. Dark matter makes up more than three-fourths of the matter in the universe, but cannot be seen via visible light or electromagnetic radiation. Instead, scientists must use distortions produced by dark matter's gravity to detect the material. In the case of galaxies, smaller dark-matter clusters could help astronomers solve a long-standing puzzle. Theory predicts that most galaxies should host dwarf galaxies in their halos, but few of these smaller galaxies have been spotted. Only about 40 of the predicted thousands of such galaxies have been seen orbiting the Milky Way. "This discrepancy between observed satellites and predicted abundances has been a major problem in cosmology for nearly two decades, even called a 'crisis' by some researchers," said team member Neal Dalal, of the University of Illinois. "If these dwarf objects are dominated by dark matter, this could explain the discrepancy while offering new insights into the true nature of dark matter," he said. According to the researchers, ALMA may bring more of these dark matter satellites to light. With its incredible sensitivity, the enormous array of instruments could pinpoint other invisible dwarf galaxies hovering around the edges of natural magnifying glasses throughout the universe. "This is an amazing demonstration of the power of ALMA," said team member Gilbert Holder, of McGill University in Canada. "We are now confident that ALMA can efficiently discover these dwarf galaxies. "Our next step is to look for more of them." Follow Nola Taylor Redd on Twitter @NolaTRedd or Google+. Follow us at @Spacedotcom, Facebookor Google+. Originally published on Space.com.